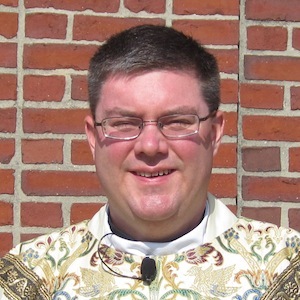 Reverend Christopher K. O’Connor was ordained a priest for the Archdiocese of Boston in 1998 and has been a weekend assistant at St John the Evangelist Parish since 2001. In addition, Fr. O’Connor is the Vice Rector at St. John’s Seminary in Brighton and a professor of Philosophy and Ecclesiology there. He has been active in the youth and global outreach ministries of the Archdiocese for the last decade, working on efforts for World Youth Day and Catholic Relief Services. He was a Parochial Vicar at St Mary’s in Chelmsford after being ordained. Fr. O’Connor reaches out to several worship communities, serving as a Weekend Assistant at Sacred Heart in East Boston, Saturday Chaplain to Missionaries of Charity, and Monthly Prison Chaplain at MCI Norfolk. You may also hear Fr. O’Connor as the weekly Tuesday Co-Host of The Good Catholic Life on Radio 1060AM in Boston. He is a graduate of Boston College High School, St John’s Seminary College, with a Bachelor of Arts Degree in Philosophy, and a Masters of Divinity. He attended Gregorian University in Rome, and also has a Ph.L from The Catholic University of America, and S.T.L from Boston College School of Theology and Ministry and is currently an S.T.D candidate there.